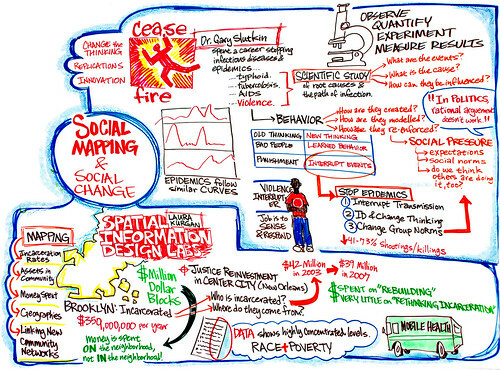 Social Mapping for Social Change from Alphachimp Studio Inc. on Vimeo. This week at at the Graham Foundation in Chicago, PopTech brought together three speakers (and a smart audience in this city of news aggregators and social good organizations) for a special salon event on the current and future impact of social mapping tools. The mash-up was a wish come true for me...literally! Salon participants, in front of graphic recording by Alphachimp. 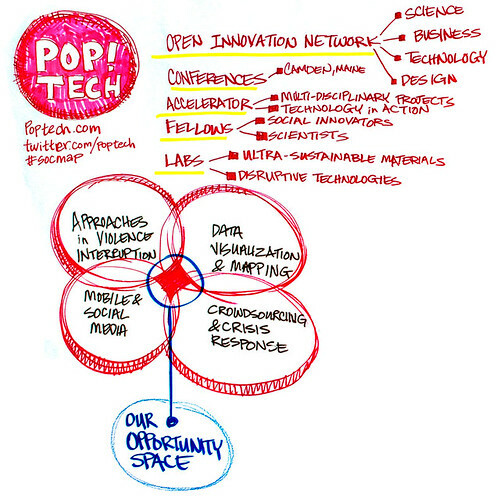 At PopTech 2009, organizers solicited ideas from the crowd on potential collaborations they would like to see emerge. 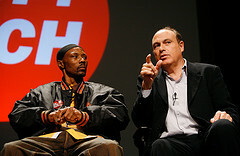 Having been invited to speak separately at PopTech’s 2008 conference, gun violence expert Gary Slutkin and video artist Lincoln Schatz teamed up to collaborate on a participatory public art project that builds on existing local community reationships to create, train and bring together non-violence advocates in a digital forum to impact social change around the issue of gun violence. A more detailed description of that collaboration is here. 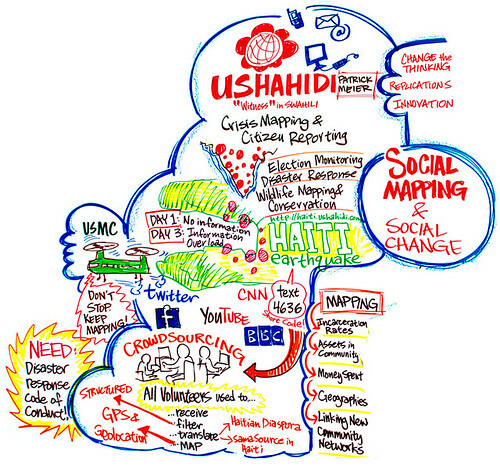 My wish was that Chicago-based artist Lincoln and Cease Fire would collaborate with African-based Ushahidi in advance of the next elections in Kenya to produce community-based art. Little did I know that this plan had already been hatched by PopTech organizers! 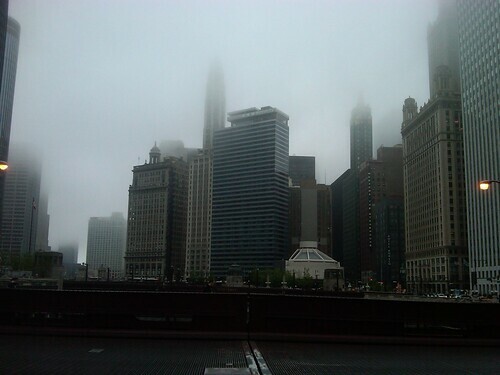 It wasn't until this week in foggy Chicago, that the plan came to fruition. Earlier in the day at Google Chicago, PopTech convened a workshop to cross-pollinated digital-world expertise in crisis mapping with real-world application of violence interruption on the streets. The workshop participants—including leading thinkers in mobile, geolocative services, social good, and philanthropy—discussed how their respective systems of organizing information and intervening in their local communities might fit together. Later that evening, at the Graham Foundation in Chicago's Gold Coast, the public salon featured three speakers (and a smart audience in this city of news aggregators and social good organizations) for a special conversation on the current and future impact of social mapping tools. 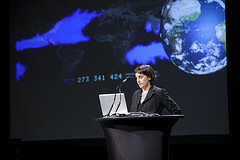 PopTech’s Executive Director Andrew Zolli and Executive Director of Ceasefire Gary Slutkin hosted the event, and included information designer Laura Kurgan, with Director of Crisis Mapping at Ushahidi Patrick Meier. Together, the private workshop and the public salon served as a great step forward, bringing together art, science, humanitarian relief, community workers, architecture, data... all for the alleviation of human suffering. The "violence interrupters" of Cease Fire, who work directly in the communities where they live to prevent the escalation of violence, were able to talk directly with designers and programmers who build the mapping and SMS technologies underneath large-scale disaster response efforts, to brainstorm life-saving measures. PopTech Social Innovation Fellow Josh Nesbit of Frontline SMS: Medic, worked directly with Ushahidi in the hours immediately following the Haitian Earthquake to enable citizens and relief workers to map the needs of victims on the ground. 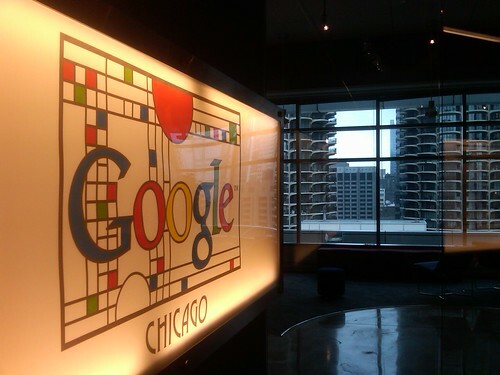 See video interview with Josh at Google Chicago here. 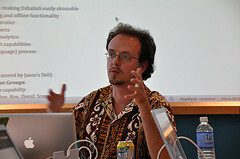 Patrick Meier of Ushahidi is an international networker and connector. He co-founded the Program on Crisis Mapping and Early Warning at the Harvard Humanitarian Initiative (HHI) and the International Network of Crisis Mappers (CM*Net). He has extensive professional experience in the fields of conflict early warning and humanitarian technology, having consulted for major international organizations in Africa, Asia and Europe. He was born in Abidjan & raised in Kenya. Patrick blogs at iRevolution & EarlyWarning. A January 2010 description of the Haiti Crisis Mapping effort by Clark Boyd of Discovery News here. 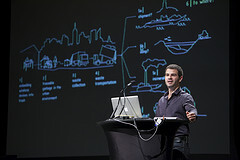 Assaf Biderman, associate director of MIT’s Senseable City Lab, who spoke at PopTech 2009 about a number of the lab’s projects that explore how technology is transforming urban spaces. One project traced flows of garbage in Seattle in order to better understand the waste removal process in cities disposal. Another illustrates the global exchange of data between New York and other cities around the world. Read more about Assaf's work and see video here. On the first anniversary of the massive earthquake in Haiti, we are highlighting one of the most successful collaborative efforts that emerged from the devastation. Patrick Meier, director of crisis mapping at Ushahidi and Josh Nesbit, executive director of Medic Mobile (formerly FrontlineSMS: Medic) took to the PopTech stage to describe how the various moving parts of Mission 4636 came together, a short code emergency response communication system that enabled Haitian earthquake victims to receive aid by sending a free text message to 4636. Video and full post here at the PopTech blog.